Amazing card. That beautiful flourish is what does it. I never could have thought to make something so gorgeous out of corn. I love it. Jeri is right! 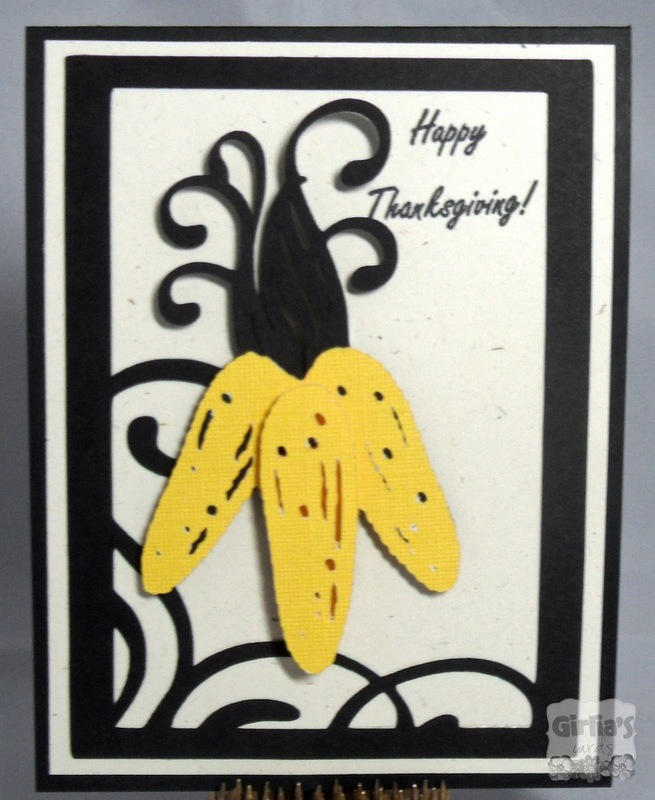 This is an elegant card and it's corn! Brilliant! This is a very beautiful card!! Great job!! This is very elegant. I love it. Great job. Very pretty and elegant. I love the swirls! Pretty card, love the white & black! A very pretty card!Awesome job! Beautiful card. Love the flourish cut! Really pretty!! Oh this card is just so beautiful and elegant Gloria! I love this! This is so pretty! I love the flourish and the matting! Great job! I love this card! love the use of only black and yellow! Great card! The corn is fabulous!